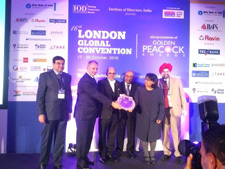 The Institute of Directors, India hosted the 16th London Global Convention on “Corporate Governance Sustainability Global Business Meet & Presentation of Golden Peacock Awards “between 17th and 20th October, 2016 .The theme of the summit was “Board’s Evolving Role in an Uncertain Global Economy”. In this Summit Doha Bank was honoured with “Golden Peacock Global Award for Excellence in Corporate Governance – 2016 “on 18th October 2016 at Millennium Hotel London Mayfair, London. Dr. R. Seetharaman, Group CEO of Doha Bank received the award from Stephen Haddrill, Chief Executive, Financial Reporting Council, UK, Baroness Sandip Verma, Global Chairperson-Advisory Council, Institute of Directors, India and Chairperson, European External Affairs Committee and Prakash P. Hinduja, Chairman of Hinduja Group of Companies – Europe, Hinduja Group Limited.